Sara received her Bachelor’s of Science in Athletic Training from Marquette University in Milwaukee, WI in 2011. She went on to earn her Doctorate in Physical Therapy from the University of Wisconsin – Madison in 2014. While in Physical Therapy school she worked as an Athletic Trainer for local high school sports, a semi-professional football team, and as a Physician Extender at the campus Health clinic. Upon graduation, she participated in a year-long APTA Orthopedic Residency program in Tacoma, WA. She then began practicing at a private practice clinic in Edmonds, WA in 2015. 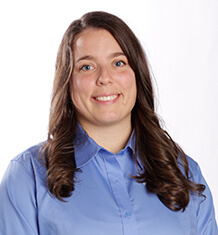 Sara joined MTI Physical Therapy in 2017 and is in the process of pursuing further training through the Ola Grimsby Institute’s (OGI) manual therapy residency program. Sara enjoys working with patients who are working towards getting back to the activities they love and has a special interest in working with high school students. When treating her patients, she strives to provide the best care possible by utilizing many different treatment techniques and approaches. Sara prefers to look at the whole body and how each of the different areas interact, in order to find the underlying cause of different conditions. In her free time, Sara can be found running, playing soccer, backpacking, traveling, or enjoying the many water activities in the Seattle area.